A really boring deleted scene from Aliens. Shockingly, the leading cause of fatal injuries in older people is falling. Getting old can also often mean getting weaker and less sure on our feet, so slipping and falling can, unfortunately, be inevitable for the elderly. However, robotic technology is here to help with an exoskeleton especially designed to prevent falls. 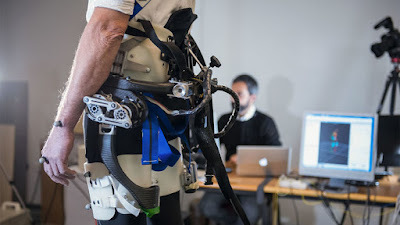 Developed at Sant'Anna School of Advanced Studies in Pisa, Italy, with help from the Swiss Federal Institute of Technology in Lausanne, the 'Active Pelvis Orthosis' straps onto the user's thighs and hips and monitors how they walk. When a slip or fall is predicted, the device lends strength to the person, helping them to keep their balance. It won't, apparently, make them superhuman, as only 30% of their natural strength is added to keep them upright, but this is still a practical and possibly life-saving use for robotic engineering.